We often end up listening to the endless arguments upon whether to be materialistic or not. While spiritually we should not really become materialistic because world’s greatest joys are not hidden in materialistic items at the same time living in a practical world around people, you cannot help but be materialistic after all without money you cannot go anywhere (think about your cab driver). 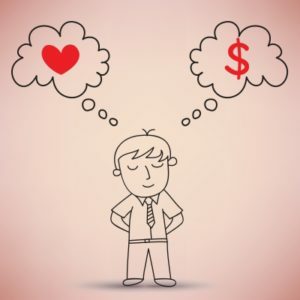 Here is our take on whether to love money or not and to what extent? Off course world’s greatest joys are hidden in the things that money cannot buy but think of the dress that you always wanted to buy, think of the vacation that is too expensive but you really wish to experience it, think of the joy which is beheld in a double crest cheesy pizza. These things are not possible without money; do you still believe that money cannot buy joy? Won’t you be joyous to see your bank balance hitting the sky? Well, isn’t the whole point of finding a job, earning well, having a well-settled life somehow revolves around earning money too. It is true that job satisfaction is primary to be thought upon but don’t you think that often money motivates you to do more or to do better? Come on who would refuse to put some extra efforts for monetary benefits offered? Whether you agree or disagree, the society has agreed upon that fact that money brings in prestige. While respect has to be earned and there are no two ways about it but your lifestyle adds on to this respect as well. A king sized lifestyle gets a king sized treatment and what is a king without treasure? Are you getting our point? We are humans and that is why our desires are unreasonably endless. However, have you ever noticed that each desire of yours stops at money? Whether you wish to learn a newer skill or pack your bags for travelling. Everything begins and ends with the amount that your bank balance reads. The unfulfilled desires bring anxiety and with no money in your hand, you are going to pile up in anxiety only. No matter how much you hate minting money so matter how much denial do you possess for money the reality is that money forms an integral and undeniable element of life. Your stand in the society, your extracurricular activities, your lifestyle, your efficiency of work and so on is determined by money. We agree that greed can dig your grave but, a complete denial of money is yet another form of digging your graves too. While it is vital to be contented with what you have, there is no harm in desiring for a little extra either. Do you love money too? Check out #AskTheAdvisor 41: 3 Things Successful Investors NEVER Do!